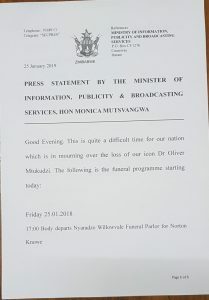 The programme of Oliver Mtukudzi’s funeral has been released. 1 bus each for the other Provinces. 2 buses have been availed for the family. 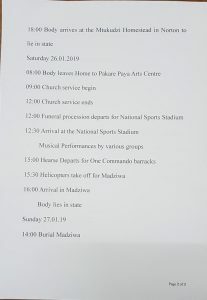 Tomorrow, 26 January 2019, a church service will be held at Pakare Paye at 9am. Body viewing will also be held there. 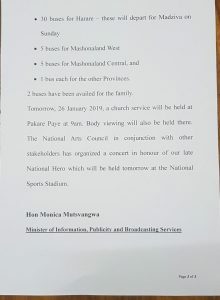 The National Arts Council in conjunction with other stakeholders has organized a concert in honour of our late National Hero which will be held tomorrow at the National Sports Stadium.